What happens when a joke video posted on the Internet generates so much hype that it actually becomes a real video game? Goat Simulator happens Video Game Hub Episode 8 - SCEA CEO Stepping Down, Goats Are Simulated, And Titans Still Falling Video Game Hub Episode 8 - SCEA CEO Stepping Down, Goats Are Simulated, And Titans Still Falling This week, we have Goat Simulator actually coming out, a new Batman game, SCEA CEO stepping down, all the Titanfall maps have been leaked, and Shaq Fu making a comeback. Read More . And as if it could be released on any other day of the year, it’s released on April 1st. It’s a simple game that sees you moving around the map as a goat destroying as many things as possible to earn points. There’s more though, as the game features a surprising amount of hidden goodies and fun stuff. It’s buggy, it’s filled with easter eggs 10 Video Game-Related Easter Eggs From Google 10 Video Game-Related Easter Eggs From Google Google Docs contains a dragon, YouTube's video player contains a hidden game, and zerglings are waiting to devour your search results when you challenge them to a battle. Over the years, many video game-related Easter... Read More , it’s dumb, and it’s so incredibly fun that you simply have to play it. It only costs $9.99, and it’s worth every penny. Check out the video we made below showcasing about 10 minutes of hilariously ridiculous gameplay. You will not be disappointed. If that doesn’t sell you on just how awesomely stupid and fun this game is, nothing will. Want more from MakeUseOf in the video department? Make sure to check out our YouTube channel and subscribe so you don’t miss out on all the awesome video content we put out! 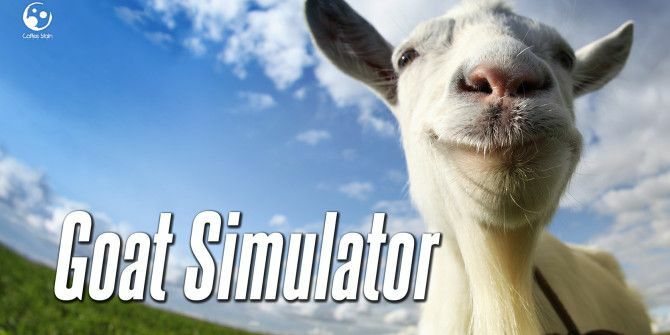 Have you tried Goat Simulator? What did you think of it? Hit the comments section below and let us know! This is probably the most entertaining video review I've watched. I'm not much of a gamer myself, so I don't often find interest in these types of videos, but you captivated me the whole way through with your hilarious semantics, Dave! Well done! I am offended by this game. I was once licked by a goat. I stuck to his tongue as he dragged me through town, bouncing from trampolines, until he finally flung me into a combat robot, who then knocked me into the spinning blades of a corn harvester. I am offended by this game because it makes light of my tragedy. One cannot just simulate the goat experience, one has to become the goat. Let the goat take over your soul, and then you will understand the way of the goat. Why can't I see this video on the youtube.com/makeuseoftv page ? Its looking funny games! are exactly is i be thought it is, GTA; yet, is with an goat. I is going too download there game.